What would you do if you had a time machine? Go watch the ancient Egyptian pyramids being built? Hang out with Jesus and turn some water into wine? Kill Hitler, maybe? These are all, no doubt, noble endeavors. But I've often said—and I stand by this—that if I had a time machine, I'd go visit the 1893 World's Fair in Chicago. 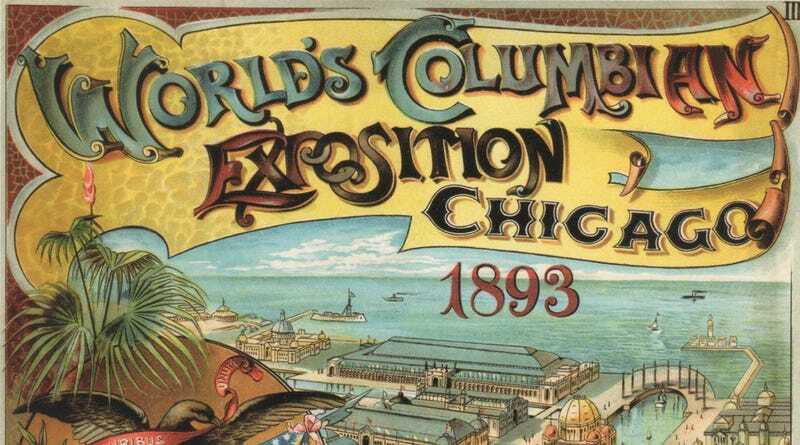 The 1893 World's Fair (officially known as the World's Columbian Exposition to honor the 400th anniversary of Christopher Columbus landing in North America) was the fair to end all fairs. It was the fifteenth such exposition in the world, and only the second in the United States. Built on Lake Michigan, nothing about the White City was small; the 40-acre, 230-foot tall Manufactures and Liberal Arts Building was at the time the largest enclosed space ever built. But the scope of its buildings pales in comparison to the legacy of technological progress it left behind. It's estimated that 1 in 4 Americans saw the Columbian Exposition in 1893, which is astounding when you consider that it was only open for just 6 months. Why do I wish I was one of the teeming millions (27 million by some estimates) who saw the Fair? Sure, there was gorgeous Beaux Arts architecture (which inspired Frank Baum when he imagined The Emerald City in The Wizard of Oz) priceless works of art, towering statues and plenty of food vendors. But there was also The Future. Like others before it, the 1893 World's Fair was where inventors from around the world could show off countless new gadgets. But Chicago stands out for the tremendous breadth of its offerings, including primitive fax machines, new telephones, an electric railway, neon lights, and electric belts claiming to cure any number of ailments. The 20th century was just on the horizon, and people swarmed to Chicago to see what was in store. As you may recall, I have a huge deadtree collection of all things paleofuture—books, magazines, photographs, etc. that I've been collecting for over six years now. Included in my archive is a collection of original World's Fair tickets. I've got tickets from the New York World's Fairs in 1939 and 1964, tickets for the 1900 Exposition in Paris, and even a ticket for the 1982 World's Fair in Knoxville (which people of a certain age will remember from a 1996 episode of "The Simpsons"). I also have a ticket to the 1893 World's Columbian Exposition, which you can see above. So grab your ticket, and let's check out some of the coolest people, buildings, ideas, and tech that the 1893 World's Fair had to offer. In many ways, the 1893 fair was Chicago's attempt to get some respect on the national stage. People from New York considered Chicago a backwater town with not much to recommend it. But the city was intent on proving itself to those big-city New Yorkers and the rest of the world with a Fair for the ages. As you can see from the poster above, Chicago wanted desperately to be known as the "Metropolis of the West" at a time when anything west of it was considered wild. Remember that in 1893 the United States only had 44 states — Utah, Oklahoma, New Mexico, Arizona, Alaska and Hawaii had yet to join the Union. Perhaps Chicago was "second," but by the late 19th century it had emerged as an economic and cultural force to be reckoned with. And this World's Fair was going to prove it once and for all. The Fair included plenty of opportunities for inventors to show off their latest and greatest offerings. And legendary inventor Nikola Tesla's contributions included some fantastic examples of technology that would come into common use later in his life, along with some fun gadgets that were just for showing off. In the latter category we find his spinning Egg of Columbus. In the former, that new-fangled AC motor. Tesla's presence was felt in more than just his display, though; his employer, Westinghouse, won the contract to illuminate the entire White City by vastly underbidding the project. So, in a way, Tesla's work—specifically his developments in AC power systems—touched virtually every part of the Fair. Tesla's exhibit, which occupied part of the Westinghouse space, featured a number of his early AC devices, including motors, armatures, and generators, phosphorescent signs of noted electricians, such as Helmholtz, Faraday, Maxwell, Henry, and Franklin, and a sign for his favorite Serbian poet Jovan Zmaj Jovanovich. Tesla also displayed vacuum tubes illuminated by means of wireless transmission, his rotating egg of Columbus, sheets of crackling light created by high-frequency discharges between two insulated plates, and other neon signs reading Westinghouse, and Welcome Electricians. These last two displays "produc[ed] the effect of a modified lightning discharge... accompanied by a similar deafening noise. This was probably one of the most novel attractions in a sensational way seen in the building, as the noise could be heard anywhere within Electricity Building and the flash of the miniature lightning was very brilliant and startling." A reproduction of an Egyptian temple from 1800 B.C. was a highlight of the Fair's Midway. But the Western Electric Company decided to build its own (much smaller) version of the Egyptian Temple display, complete with glowing electric lights inside. The next most prominent exhibit in the [Electrical] building is that of the Western Electric Company, of Chicago, immediately to the east of the main south entrance. This company has three pavilions, one as Egyptian temple paneled on the outside most uniquely with Egyptian figures and groups associated with electricity. For instance, there is a group of Egyptian maidens, of the time of Rameses the Second, operating a telephone board, and another group is of men of the same period laying telegraph lines. The conceit is very popular. Below is a photo of the Egyptian temple's interior from the book The Chicago World's Fair of 1893: A Photographic Record by Stanley Appelbaum. The telautograph was invented by American electrical engineer Elisha Gray and made its public debut at the 1893 Fair. An invention that was first patented by Gray in 1888, we might best understand it today as a primitive fax machine, converting handwriting to electrical impulses which could then be sent and reproduced across great distances. One of the downsides of all this futuristic technology present at the Fair had to be the overwhelming sounds. By most historical accounts, there was a deafening noise of machinery at the 1893 Fair. Apparently no one understood before the Electrical Building opened just how much noise would be produced when showing off all this technology in a confined space. During peak hours, many people left after just a few minutes when they were confronted with the noise of the machines. The noise of the future wasn't for everybody. I recently spent half a year looking at the 1962-63 TV show "The Jetsons," arguably one of the most important TV shows of the 20th century for its use as a cultural touchstone about the future. And the Chicago World's Fair presaged one of its key creations nearly 75 years before it went on the air. You may recall that the Jetson family is kind of lazy. Machines do all their work for them, and there are moving sidewalks absolutely everywhere. But contrary to the assumptions of many people who grew up with "The Jetsons" and real-world moving sidewalks in places like airports, this promise of the future predates that mid-century cartoon family. In fact, the electric moving sidewalk made its debut at the 1893 Fair. The illustration above comes from the 1890 proposal by Alfred Speer for a moving sidewalk. Speer patented the idea two decades earlier, but his "movable pavement" wouldn't see the light of day until Chicago took up its cause. These belts were to be made up of a series of small platform railway cars strung together. The first line of belts was to run at a slow velocity, say 3 miles per hour, and upon this slow belt of moving pavement, passengers were expected to step without difficulty. The next adjoining belt was intended to have a velocity of 6 miles per hour, but its speed, in reference to the first belt, would be only 3 miles per hour. Each separate line of belt was thus to have a different speed from the adjacent one; and thus the passenger might, by stepping from one platform to another, increase or diminish his rate of transit at will. Seats were to be placed at convenient points on the traveling platforms. Somewhat strangely, few photographs of the 1893 moving sidewalk that was actually built in Chicago remain in existence. Below is the only photo I've been able to find of the moving walkway at the 1893 World's Fair. Sadly, I've never seen a photo with people actually using it. The 633 acres of the Fair was to be a "pure" environment. A council of women whose job it was to police morality and “decent Protestant standards” at the Fair were quite upset when they learned that the seedier elements—like belly dancers, sideshow acts and carnival-type rides—were setting up shop just outside the main gates. But in fact the “Midway,” as it became known (introducing this word to the national lexicon), was where the organizers of the Fair really made their money. The map below shows where the Midway was placed: Way out west, quite literally on the wrong side of the tracks. The Ferris Wheel made its debut at the Midway of the 1893 Fair. It was supposed to rival the Eiffel Tower, which was the centerpiece of the Paris Exposition of 1889. But needless to say, it didn't quite have the same staying power. The original Ferris Wheel was taken apart and shipped to the 1904 World's Fair in St. Louis. But after that fair, it was demolished in 1906. When the World's Fair opened in 1893, equal rights for women was still a futuristic dream. American women couldn't vote and were relegated to the margins of public life. But the times they were slowly changing. Prominent women spoke at the Fair about a number of issues, including women's right icon Susan B. Anthony, labor rights reformer Florence Kelley, and abolitionist Julia Ward Howe. By authorizing and funding the Chicago fair's Board of Lady Managers [in 1893], Congress was in fact recognizing the increasingly organized and influential role of women in American society. New technologies such as domestic plumbing, canning, commercial ice production, and the sewing machine had freed middle-class women from many household tasks, and more and more women were entering college and the professions. Many, including upper-class and professional women, were also joining social reform groups, and these women's organizations had, in turn, organized to increase their visibility and influence. Agriculture will be developed by electricity, the motive power of the future. Science will take in condensed form from the rich loam of earth the life force or germs now found in the heart of the corn, the kernel of the wheat, the luscious juice of the fruits. A small phial of this life from the fertile bosom of mother earth will furnish man with subsistence for days, and thus the problems of cooks and cooking will be solved. The slaughter of animals, the appetite for flesh meat that has left the world reeking with blood and bestialized humanity, will be one of the shuddering horrors of the past. Slaughter houses, butcher shops and cattle pens will be converted into conservatories and beds of bloom. Despite the presence of prominent women at the Fair, there were still some important slights. The Fair's single largest event, held on July 4, 1893, didn't include a single woman speaker. In response, five women from the National Woman Suffrage Association stormed the Independence Day program and handed a copy of their Declaration of Rights for Women to the chairman of the event. Women in the United States wouldn't get the vote until nearly three decades later with the ratification of the Nineteenth Amendment to the U.S. Constitution in 1920. Some foods that are still popular today made their debut at the 1893 Columbian Exposition, including Cracker Jack, shredded wheat, and Wrigley's Juicy Fruit chewing gum. And while it didn't debut at the Fair, one beer popular with those darn kids today did get a name change thanks to the Chicago fair. According to Pabst, the beer changed its name to Pabst Blue Ribbon after being declared "Best Beer" at the 1893 Fair. While this was true, in fact, the best beer distinction didn't come with a blue ribbon. And according to some people, it really needs to stop coasting on its 19th century win. Admittedly, there are dozens of technologies, people, ideas and generally futuristic spectacles that were present at the Fair that I'm not even aware of. Sometimes I'll see hints of something—like the sign "Clothing Cut By Electricity" in the photo above—and wonder what the specifics of that display must have been. How did those machines work? How did people react when they saw them for the first time? What did they sound like? This, my friends, is why I need that time machine. It's great to read about the Fair, gaze at photos, and watch documentaries—but there's just no substitute for being there. A photo can't capture the feeling in the air; the smell of chugging machines, the breeze off Lake Michigan, and the stench of 19th century human body odor. Anyone who tells you that looking at photographs is just like time travel is a liar. Time travel is just like time travel, and should you ever find anything close to Doc Brown's machine, please drop me a line. We can go hang out with Jesus, right after we make a quick stop at the 1893 Chicago World's Fair.